After months of wearing braces it's time for the big reveal: your new and improved smile! Your once crooked teeth are now straight and uniform. But a look in the mirror at your straighter teeth might still reveal something out of place: small chalky-white spots dotting the enamel. These are most likely white spot lesions (WSLs), points on the enamel that have incurred mineral loss. 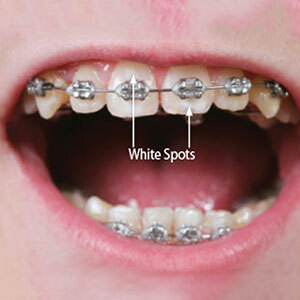 It happens because mouth acid shielded by your braces contacted the teeth at those points for too long. Most mouth acid is the waste product of bacteria that thrive in dental plaque, a thin film of food particles that can build up on tooth surfaces. High levels of acid are a definite sign that plaque hasn't been removed effectively through brushing and flossing. But normal hygiene can be difficult while wearing braces: it's not easy to maneuver around brackets and wires to reach every area of tooth surface. Specialized tooth brushes can help, as well as floss threaders that help maneuver floss more easily through the wires. A water irrigator that uses pulsating water to remove plaque between teeth is another option. However, if in spite of stepped-up hygiene efforts WSLs still develop, we can treat them when we've removed your braces. One way is to help re-mineralize the affected tooth surfaces through over-the-counter or prescription fluoride pastes or gels. It's also possible re-mineralization will occur naturally without external help. While your teeth are sound, their appearance might be diminished by WSLs. We can improve this by injecting a liquid tooth-colored resin below the enamel surface. After hardening with a curing light, the spot will appear less opaque and more like a normal translucent tooth surface. In extreme cases we may need to consider porcelain veneers to cosmetically improve the tooth appearance. In the meantime while wearing braces, practice thorough dental hygiene and keep up your regular cleaning visits with your general dentist. If you do notice any unusual white spots around your braces, be sure to see your dentist or orthodontist as soon as possible. Though many people consider root canals to be a scary or unpleasant procedure, they are a powerful dental tool which can actually save your infected tooth’s structure and help you avoid tooth extraction. Understanding this important process and how it works can help you decrease your fear and undergo this procedure anxiety-free. Find out more about root canals, signs that you may need one, and how this procedure works with Dr. Nicholas Papapetros, Dr. Jhon Giraldo, and Dr. Paul Masterson at Stiles Family Dentistry in Salem, NH. A root canal is a dental procedure used when a tooth has significant damage or decay which has compromised its inner tissues and nerves, normally causing a toothache. A root canal’s goal is to save the natural outside structure of the tooth while relieving pain and discomfort caused by the compromised nerves. Most patients report that their toothache is gone by the time they leave their dentist’s office and stays away for good after a root canal. Additionally, root canals help repair broken teeth which have exposed the inner tissue of the tooth to the elements, causing pain and discomfort. A root canal procedure usually takes about an hour and occurs during an appointment at your dentist’s office. Your dentist will numb your tooth prior to beginning the procedure so you will feel no discomfort during your treatment. Your dentist will then remove the tissues and nerves inside the tooth, fill it in, and, in most cases, complete the root canal by capping the tooth using a dental crown. For more information on root canal therapy, please contact Dr. Nicholas Papapetros, Dr. Jhon Giraldo, and Dr. Paul Masterson at Stiles Family Dentistry in Salem, NH. Call today (603) 893-4538 to schedule your appointment! If you’re over age 30 there’s a fifty percent chance you have periodontal (gum) disease—and you may not even know it. Without treatment this often “silent” bacterial infection could cause you to lose gum coverage, supporting bone volume or eventually your teeth. That’s not to say there can’t be noticeable symptoms like swollen, red, bleeding or painful gums. But the surest way to know if you have gum disease, as well as how advanced it is, is to have us examine your gums with manual probing below the gum line. 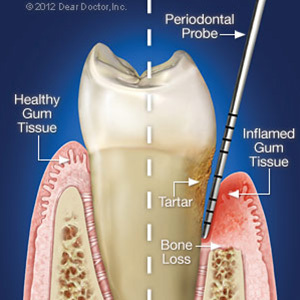 Using a long metal device called a periodontal probe, we can detect if you’ve developed periodontal pockets. These are gaps created when the diseased gum’s attachment to teeth has weakened and begun to pull away. The increased void may become inflamed (swollen) and filled with infection. During an exam we insert the probe, which has markings indicating depths in millimeters, into the naturally occurring space between tooth and gums called the sulcus. Normally, the sulcus extends only about 1-3 mm deep, so being able to probe deeper is a sign of a periodontal pocket. How deep we can probe can also tell us about the extent of the infection: if we can probe to 5 mm, you may have early to mild gum disease; 5-7 mm indicates moderate gum disease; and anything deeper is a sign of advanced disease. Knowing periodontal pocket depth helps guide our treatment strategy. Our main goal is to remove bacterial plaque, a thin film of food particles that collects on teeth and is the main cause and continuing fuel for the infection. In mild to moderate cases this may only require the use of hand instruments called scalers to manually remove plaque from tooth surfaces. If, however, our periodontal probing indicates deeper, advanced gum disease, we may need to include surgical procedures to access these infected areas through the gum tissue. By knowing the depth and extent of any periodontal pockets, we can determine whether or not to use these more invasive techniques. Like many other health conditions, discovering gum disease early could help you avoid these more advanced procedures and limit the damage caused by the infection. Besides daily brushing and flossing to remove plaque and regular dental checkups, keep watch for signs of swollen or bleeding gums and contact us for an appointment as soon as possible. And be aware that if you smoke, your gums will not likely bleed or swell—that could make diagnosis more difficult. What's a Root Canal and When Is It Needed?